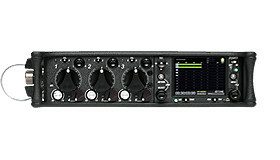 The optional CL-12 linear fader controller significantly expands the mixing capability of the 688. The CL-12 attaches directly to the 688 via a single USB cable that provides both power and control, making transitions between cart-based setups and over-the-shoulder workflows quick and easy. The CL-12 is compatible with the 688. 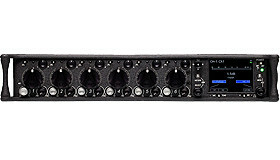 With the CL-12, the 688 gains a 3-band parametric equalizer for each of its 12 inputs, shortcut access to SuperSlot™ wireless receiver data (when used with the SL-6), and MixAssist™ auto-mix monitoring. 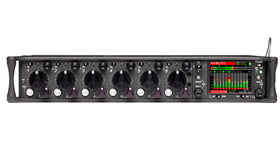 The CL-12 features large, backlit transport buttons for record and stop, as well as numerous dedicated buttons for fast access to menus and other key functionality, such as track arming, naming, and routing. Metadata entry is a button press away, and there are buttons for PFL, HPF, phase inversion, COMs and RTNs. There are even three user-definable buttons for flexible customization. The CL-12 comes in two models. The standard CL-12 is designed to be a sleek and durable mixing surface with robust black aluminum side panels. Tactile controls, including illuminated buttons and twelve easy-to-use manual faders, combine with LED metering to improve the whole mixing experience. In addition to offering everything the standard CL-12 does, the CL-12 Alaia also features incredibly smooth gliding Penny & Giles faders — the best in the industry. Gorgeous custom hardwood side panels also enhance the look of the CL-12 Alaia. Available in either Blonde Maple or Red Mahogany, the panels are handmade by Amish craftsmen specifically for Sound Devices, LLC. The CL-12 Alaia also comes with a pair of black aluminum side panels.